Information about the fellowship program is available from past fellows in this video. For specific questions, including details on how to apply, interested physicians can contact the Fellowship Coordinator. The Division of Hematology/Oncology at Indiana University School of Medicine is a part of the IU Melvin and Bren Simon Cancer Center, a National Cancer Institute (NCI)-designated Cancer Center since 1999, and the only center with such distinction in Indiana that provides patient care. The school’s Division of Hematology Oncology is comprised of a diverse faculty with expertise in every major hematologic and oncology disease. The faculty has played a major role in establishing the standards for care in various malignancies including germ cell tumors, breast cancer, thymoma and lung cancer. The division has a multi-disciplinary clinic in prostate cancer, lung cancer, breast cancer, gastro-intestinal tumors, head and neck cancer, melanoma, testicular, bone marrow transplant, and precision genomics, among others. In addition to their clinical expertise, IU School of Medicine faculty have been a part of serving as national and international leaders. Excellent mentoring opportunities over the years have assisted many IU School of Medicine Hematology/Oncology Fellowship graduates in becoming national and international leaders in their respective fields. Lawrence Einhorn, MD, in 2000-2001 and Dr. George Sledge in 2010-2011 served as prior presidents of American Society of Clinical Oncology (ASCO). Several IU School of Medicine faculty and former fellows serve in other leadership capacities for ASCO, including the Board of Directors. Hal Broxmeyer, PhD, served as president of the American Society of Hematology (ASH) in 2010. Several IU School of Medicine faculty and former fellows serve in leadership capacities as members of the Oncology Drug Advisory Committee (ODAC) to the FDA. Several IU School of Medicine faculty and former fellows serve as editors of major oncology journals, including the Journal of Clinical Oncology (JCO). The Hematology Oncology Fellowship program at IU School of Medicine is customizable to meet the career goals of training physicians. The school devotes a major teaching effort to maximize the likelihood that fellows gain all requisite skills to compete successfully for research funding in academia and to be optimally prepared for careers in academic medicine as teacher- investigators. At the same time, fellows are preparing for a successful career in general hematology/oncology in a private practice setting. The program provides outstanding clinical training, excellent mentoring, and the ability to adapt the training experience to meet individual professional goals, within a nuturing and collegial atmosphere. The Division of Hematology/Oncology at Indiana University School of Medicine offers a combined three year program. Fellows are offered the opportunity to be eligible for board certification in both disciplines of Hematology and Medical Oncology. Fellows also have the option of pursuing a two year program in one of the two sub-specialties. 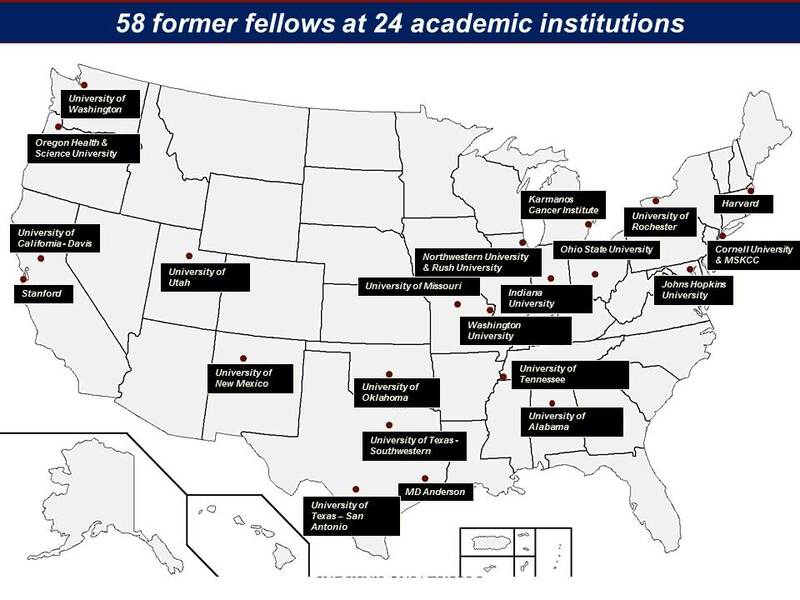 The number of fellows in the combined program is variable, based upon individual research interests of senior fellows. In general, 15 fellowship positions are available. The program has received the highest level of accreditation by the ACGME with a maximum cycle length of five years. During the period from 2013 to 2015, all (100 percent) of IU School of Medicine Hematology Oncology fellows who were eligible for and elected to take ABIM certifying exams in Hematology and Medical Oncology received passing scores. Each fellow has a continuity-of-care clinic throughout their three-year fellowship, where the fellow is autonomous to care for a cohort of patients under the direction of committed faculty. This includes a hematology or oncology clinic at the VA Medical Center or Eskenazi Health. In addition, each fellow has a rotating three-month sub-specialty clinics throughout their three years. Fellows have the unique opportunity to rotate at Indiana Hemophilia and Thrombosis center, focusing on benign hematologic conditions. While on the in-patient or consult services at IU Health, Eskenazi or the VA, the fellow plays a prominent role as the junior attending, supervised by a faculty member. 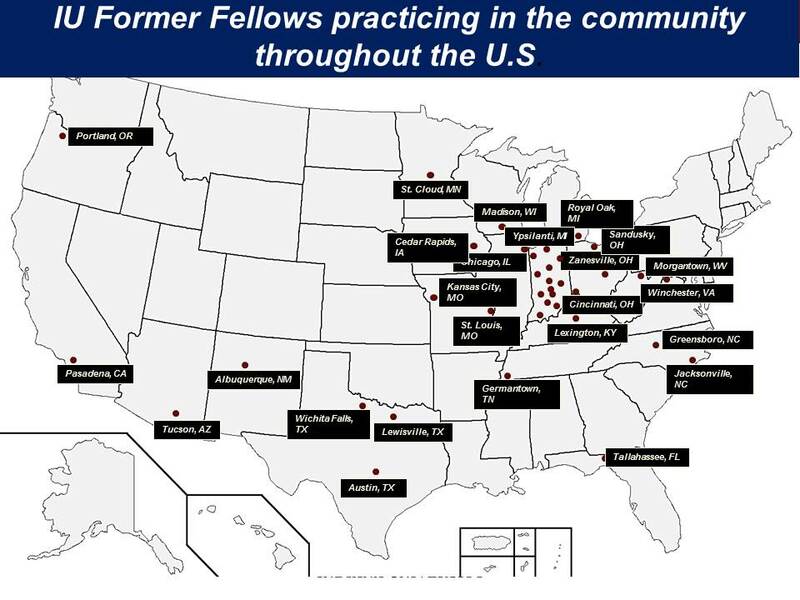 Former fellows have spread across the country at academic institutions and throughout the community to practice their skills. Within the program, each fellow is expected to engage in a mentored research project during their fellowship. Unique opportunities exist for fellow research, including the Komen Tissue Bank, Brown Center for Immunology, Walther Cancer Institute, Regenstreif Institute, BIG 10Research Consortium, and the Hoosier Cancer Research Network, which is a community based oncology group that provides excellent opportunity for fellow led clinical trial design. Support is available for additional training in Masters of Public Health, Masters of Clinical Research, and Clinical Pharmacology. Formal conferences are considered to be a central part of the fellow’s education. These include weekly subspecialty multi-disciplinary conferences, educational lecture series, academic half-days, grand rounds, and monthly journal club. Mentorship is provided by both individualized faculty and a formal mentoring committee. Weekly Lymphoma/Leukemia Fellows conference Research Foundation Workshop, designed to educate fellows on the basic skills of protocol and grant writing. Fellows are encouraged to apply for funding via this educational series. This training program is in the heart of downtown Indianapolis. Fellows enjoy spending time together outside of work exploring Indianapolis, including Mass Ave, Broad Ripple and the Canal. More information about the IU School of Medicine–Indianapolis campus and local events reinforce the vibrant livability of this city. For more information about the program or information on how to apply, contact the Fellowship Coordinator.